Surprise your student with a care package filled with hearty meals guaranteed to keep them satisfied. This pack is filled with ready-to-cook meals to help them save time and eat great - no matter what their busy student schedule holds. Plus, it all SHIPS FREE when you order today. 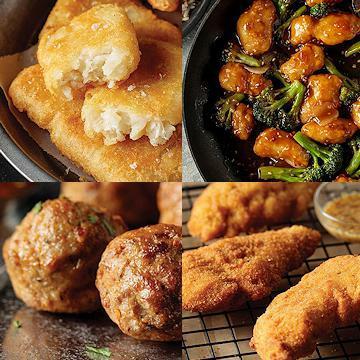 From our customer-favorite Italian Chicken Fingers to our exclusive Sesame Chicken Skillet Meal that's ready to eat from the freezer in under 15 minutes, this gift is simply packed with delicious options for any night of the week. Order today and get it SHIPPED FREE! Uncooked: For safety, must be cooked to an internal temperature of 165�F, as measured by use of a thermometer. Do Not Thaw! Preheat oven to 450�F. Place desired number of pieces on a cookie sheet, allowing 1 inch or more between pieces. Bake, uncovered, for 20-25 minutes. Do Not Thaw. Keep Frozen Until Ready To Use. Appliances vary, adjust cook time accordingly. Stove Top: Open meal bag and remove the sauce pouch and the rice pouch. Begin thawing sauce pouch in bowl of HOT water while preparing meal. On stove top heat 10-inch NONSTICK skillet over medium-high heat. Add 1 tablespoon oil and remaining bag contents to skillet. Add 2 tablespoons water to skillet, cover and cook for 9 minutes, stirring occasionally. Microwave rice pouch on HIGH for 3 minutes. Add thawed sauce to the skillet and stir to coat ingredients. Cook uncovered for 1-2 minutes or until sauce is hot and bubbling. Carefully remove rice pouch from the microwave, open and pour into serving dish. Pour contents of skillet over rice and serve. Garnish with sesame seeds. OVEN: Preheat oven to 350�F. Place meatballs 1 inch apart on a foil lined baking sheet. Heat for 20 minutes or until internal temperature reaches 140�F. Do Not Thaw! Bake: Preheat oven to 425� degrees. Place cod portions in a single layer in shallow baking pan. Bake uncovered for 15 to 17 minutes. Turn half way through cooking time for crisper fillets. Fish is fully cooked when it reaches an internal temperature of 165�F. Ingredients: COOKED LONG GRAIN WHITE RICE (COOKED LONG GRAIN WHITE RICE, WATER), COOKED TEMPURA CHICKEN (CHICKEN BREAST MEAT, WATER, SALT, SODIUM PHOSPHATE. COATED WITH: WATER, ENRICHED WHEAT FLOUR [WHEAT FLOUR, MALTED BARLEY FLOUR, NIACIN, REDUCED IRON, THIAMINE MONONITRATE, RIBOFLAVIN, FOLIC ACID], CORN STARCH, DEXTRIN, MODIFIED POTATO STARCH, RICE FLOUR, SALT, NONFAT DRY MILK, LEAVENING [SODIUM ACID PYROPHOSPHATE, SODIUM BICARBONATE, MONOCALCIUM PHOSPHATE), EGG WHITES, EGG YOLK POWDER, DEXTROSE, XANTHAN GUM), COOKED IN VEGETABLE OIL. SAUCE (WATER, BROWN SUGAR, MIRIN [CORN SYRUP, WATER, DISTILLED VINEGAR, FERMENTED RICE EXTRACT (RICE, ALCOHOL, SALT, CITRIC ACID), BROWN SUGAR, POTASSIUM SORBATE AND SODIUM BENZOATE (PRESERVATIVE)], SOY SAUCE [WATER, WHEAT, SOYBEANS, SALT], ONION, CANOLA OIL, CHICKEN CONCENTRATE [CHICKEN STOCK, NATURAL FLAVOR, SALT, SUGAR, YEAST EXTRACT, CHICKEN FAT], SESAME OIL, GARLIC [WATER, GARLIC], SESAME SEED, CORN STARCH, GINGER [GINGER, WATER], CHILE SAUCE [RED CHILE PEPPERS, DISTILLED VINEGAR, SALT, XANTHAN GUM], WHITE DISTILLED VINEGAR), BROCCOLI FLORETS, ONIONS. CONTAINS: EGGS, MILK, SOY, WHEAT. Ingredients: BEEF, WATER, SEASONING (MALTODEXTRIN, WHEY, SALT, DEHYDRATED ONION, GARLIC POWDER, DEHYDRATED PARSLEY, NATURAL FLAVORS, SPICE, DEHYDRATED CELERY, ROMANO CHEESE [PASTEURIZED COWS MILK, CHEESE CULTURES, SALT, ENZYMES], BEEF BROTH, MALIC ACID), BREAD CRUMBS (BLEACHED WHEAT FLOUR, SOYBEAN OIL, DEXTROSE, LEAVENING [SODIUM ACID PYROPHOSPHATE, SODIUM BICARBONATE], WHEY, OLEORESIN PAPRIKA), TOMATO PASTE (TOMATOES), SODIUM TRIPOLYPHOSPHATE. SET IN VEGETABLE OIL. CONTAINS: MILK, WHEAT. Ingredients: COD, WATER, ENRICHED WHEAT FLOUR (FLOUR, NIACIN, REDUCED IRON, THIAMINE MONONITRATE, RIBOFLAVIN, FOLIC ACID), VEGETABLE OIL (CANOLA, COTTONSEED, AND/OR SOYBEAN), MODIFIED CORN STARCH, YELLOW CORN FLOUR, CONTAINS 2% OR LESS OF: CORN STARCH, NATURAL FLAVORS, SALT, WHEY, LEAVENING (SODIUM ACID PYROPHOSPHATE, SODIUM BICARBONATE, CALCIUM LACTATE), SUGAR, PALM OIL, DEFATTED SOY FLOUR, SOY PROTEIN ISOLATE (WITH SOY LECITHIN), EGG WHITES, SODIUM TRIPOLYPHOSPHATE (TO RETAIN MOISTURE). CONTAINS: FISH (COD), WHEAT, SOY, MILK, EGGS.